Overland Park has taken a natural approach to fighting algae. 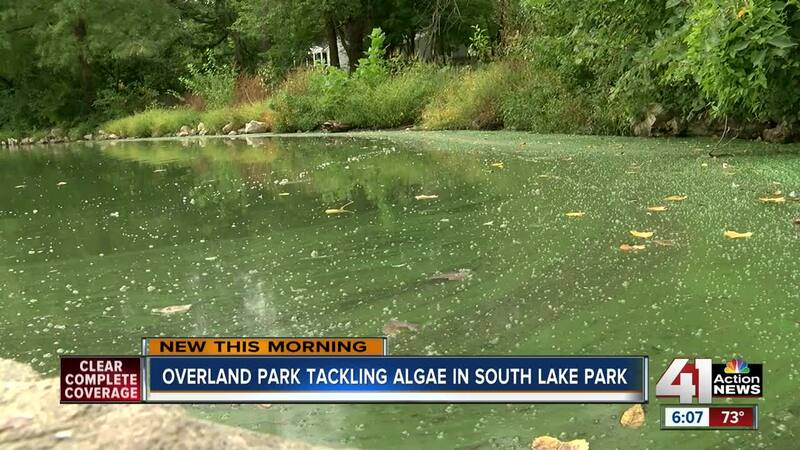 OVERLAND PARK, Kan. - Overland Park has taken a natural approach to fighting algae. Toxic blue-green algae has become a growing problem at South Lake Park, escalating over the past two years. In September, the city installed a "floating wetland" at the park, located north of 87th Street between Metcalf and Lowell Avenue. Water Specialist Ian Fannin-Hughes said nutrients and bacteria from fertilizers and other factors dump into the lake after rainstorms. Those nutrients feed algae. The native plants in the floating wetland should feed on those same nutrients, choking off the algae from food. "The idea is to see if this is going to work, to see if we have good survivability, if we can keep the geese off," Fannin-Hughes said. "Over time, if we see this is a viable project, that it can be low maintenance, we will double or maybe triple it to start making a bigger impact in the lake." So far the city has spent less than $10,000 on the project. The algae can cause rashes if it touches your skin. The Kansas Department of Health and Environment placed the lake on its warning list due to poor water quality. Fannin-Hughes said water from Overland Park has an impact on the ecosystem. "If we can work to clean up the water quality in this small lake, we can make one small little impact that will hopefully resound down through the watershed, through the Indian Creek, through the Missouri River, down into the Mississippi River and into the Gulf of Mexico," Fannin-Hughes said. "That would hopefully limit the algal blooms down there, and clean up the water for people who need to drink the water further downstream." South Lake does not hold any drinking water. Fannin-Hughes said there are things everyone can do to keep the water clean. He recommends using less yard fertilizer, picking up pet waste, and checking your septic tanks regularly.